Amtrak recently announced that they have an improved online booking system. We checked it out and found that the system really does make it easy to find the cheapest rates. You just pick where you want to travel to and from, plus the dates you want to travel, and they’ll show you a list of all the available trains. You can sort the list by departure time, price and by duration. And the best part is that they clearly lay out the prices for their Saver, Value, Flexible, and Premium Service fares. There can be a significant difference between the different fare types. On a mid-week trip from Washington DC to New York City, the fares ranged from $49 for the “Saver” rate to $125 for the “Premium Services” rate on the same train. The main difference between the fares is how refundable they are. Saver Fares – The lowest fares available. These include special offers, web-only discounts, and advance purchase discounts. Saver Fares are non-refundable but they can be canceled and the ticket value will be saved to an eVoucher that you use toward future travel with Amtrak. Value Fares – These can be fully refunded if canceled more than 24 hours prior to the scheduled departure. There is a 10% refund fee if canceled less than 24 hours in advance. Value Fares can also be canceled and have the ticket value transferred to an eVoucher that you can use toward future travel with Amtrak. Flexible Fares – These are fully refundable without any refund fee. Premium Service Fares – These include upgrades, such as first class service and sleeping accommodations. ALWAYS start by checking the available fares as an “adult” traveler using the general “buy tickets” tab (not the “other discounts tab”). You can try other search options after that, but we found that some of the best discounts only displayed for an adult traveler without any discounts applied. In searching through fares with Amtrak’s online booking service, we checked prices with several of their discount options and compared them to the Saver Fare. The Saver Fare was often significantly cheaper than the fare with discount programs such as Senior, Military or AAA. But if you do your fare search with one of those discount programs checked, they don’t show you the Saver Fare. So, be sure to do your search under both the “other discounts” tab and the standard “buy tickets” tab to make sure you’re really getting the best rate. And even under the regular “buy tickets” tab, if you’re an older traveler and you put yourself under “Senior” when you enter the number of people traveling, they won’t show you the Saver Rate. Great news for families traveling with children – kids age 2-15 get a 50% discount and infants under 2 years of age travel for free. 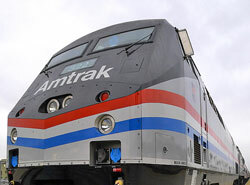 See Amtrak’s official information on the fare discounts they offer.